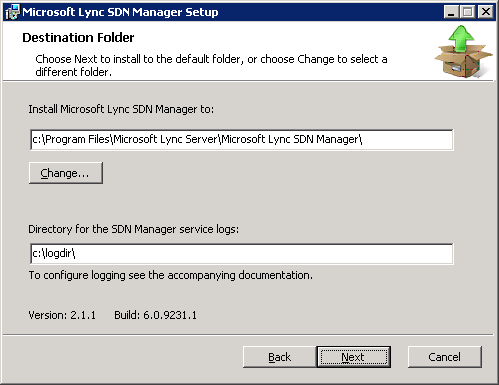 Copy the LyncSDNManager.msi package to the server computer hosting LSM. Choose the LyncSDNManager.msi to launch the installation. 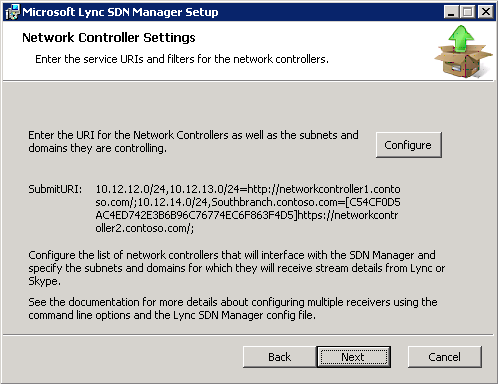 In the Welcome to the Microsoft Lync SDN Manager Setup Wizard, choose Next. Accept the End-User License Agreement and then choose Next. In the Destination Folder panel, keep the default or enter a custom LSM installation directory. Do the same for the service logging directory. 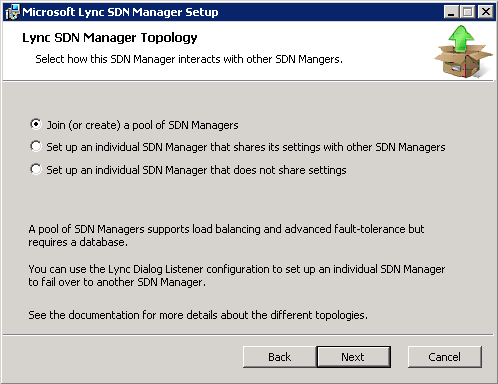 In Lync SDN Manager Topology, select one of the following options: Join (or create) a pool of SDN Managers, Set up a single SDN Manager that shares its settings with other SDN Managers, or Set up a single SDN Manager that does not share settings. 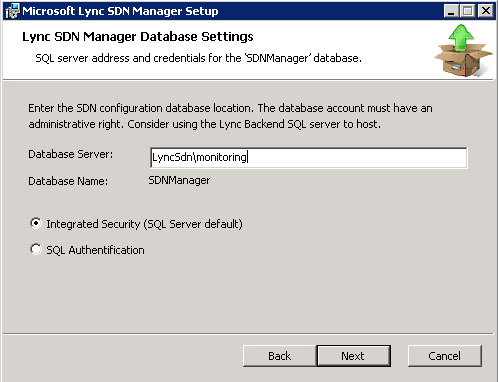 In Lync SDN Manager Database Settings, enter a SQL server name and database instance name, if appropriate, in the Database Server: field (for example, LyncSdn\monitoring). Select either the Integrated Security or SQL Authentication option as the credentials that the LSM uses to access the database. Make sure to use the credentials with the sufficient privileges to access, create and configure the database. Then choose Next. After the installer has successfully contacted the database server, it will either create a new SDN Manager database or connect to an existing one successfully. Choose Next. All the LSMs in the pool must be consistently configured with either Integrated Security or the same SQL user. In Network Controller Settings, keep the default or configure the network controller URIs, its controlling subnets and domains, and choose Next. If you chose Configure in the previous step, set one or more network controller service URIs in the Network Controller Configuration panel. You can also specify the subnets to filter out the traffic from the specified subnets or domain, as well as the client certificates to use. 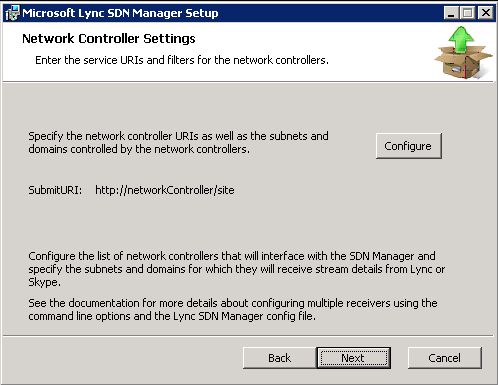 The network controller URI defines the service endpoint for where the LSM locates a specific web service for the network controller to receive the Lync call and quality data. By default, all configured network controllers receive all messages but in practice each network controller is limited to control a particular set of subnets and, possibly, SIP domains. To better target messages only to network controllers that can use particular messages, on this panel you can further define the list of subnets and/or domains for a network controller. If you use mutual TLS authentication, this panel enables you to select a client certificate to use for each network controller. 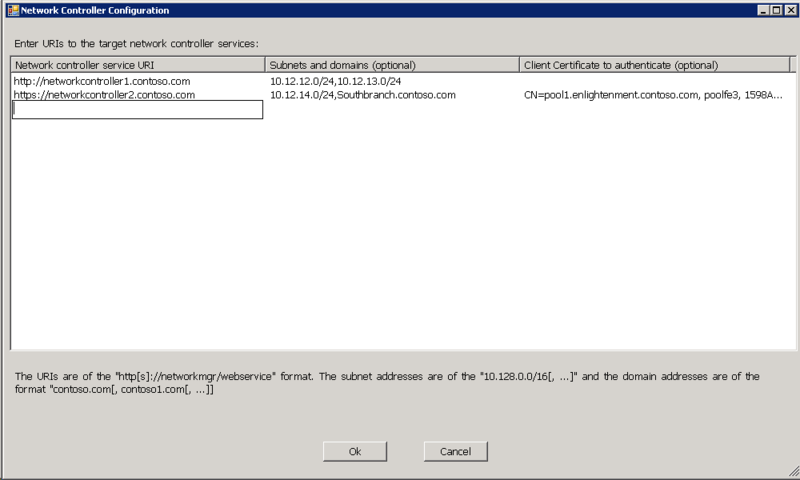 The same set of client certificates must be installed on each LSM. Choose Ok to return to the Network Controller Settings panel that also displays the resultant submitUri value. In the Ready to install panel, click the Install button to start the installation. In the wizard completed panel, click Finish to exit the installation wizard.